There was once an experiment in the desert called the Biosphere where scientists created a perfect living environment for human, plant and animal life. This clear glass dome housed an artificial, controlled environment with purified air and water. Healthy soil and filtered light were added to simulate perfect growing conditions for plants and trees. People lived in the biodome, sometimes for many months at a time. But there was one major problem. When the trees reached a certain height, they would topple over, sometimes narrowly missing the structures that housed people. But one day, an astute scientist realized they forgot to add the natural element of wind. Healthy trees require wind to blow against them because it forces their roots to grow deeper. This supports the tree as it grows taller. It’s one of nature’s lessons that we can all heed. Sometimes, like recently, the stock market needs a good shaking to bring it back even stronger. From October 2 to December 24, the stock market dropped just shy of 20%. At one point in early December, the month was shaping up to be the worst December since the 1930s. It seemed like every time you turned on the financial news, the Dow Jones Industrial Average was down another 400 points. Fear was everywhere. 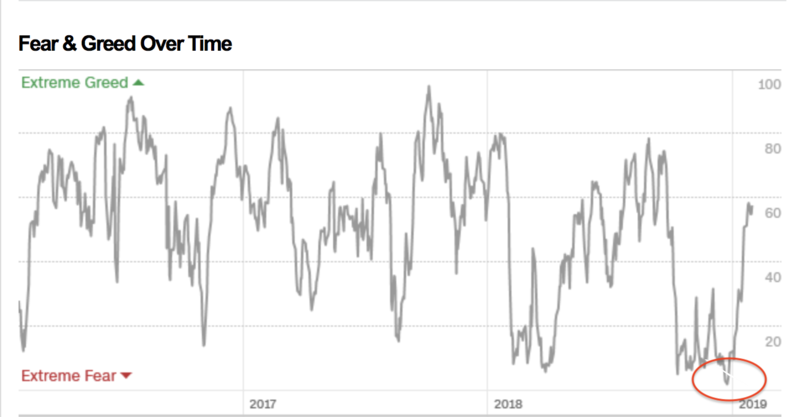 One of my favorite readings of sentiment, CNN Money’s Fear & Greed Index, ticked the most fearful reading in three years. What doesn’t topple the tree only makes it stronger. The market was shaking out the weak hands. The stock market, like all things, goes through cycles. In the depths of the worst part of the cycle, the seeds are planted for the next rally. The dot-com bubble led to a complete Nasdaq Composite Index bust, which then led to a 735% rally in the past 16 years. During the financial crisis, the S&P 500 Index lost 50% of its value. It has since tripled off those lows. Within every market’s decline, weak hands sell to stronger hands. Cynical investors exchange their stocks for cash. At the same time, investors with a more sanguine view of the future enter with stronger hands at lower prices. This is the dynamic that makes the roots even stronger for the next rally. Federal Reserve Chairman Jerome Powell ignited this recent storm with his October 3 statement. He said that the central bank was a “long way” from the neutral rate and that more rates are in the forecast. What looked like a stock market breakout quickly turned into a shakeout as stocks began falling like coconuts on windy days. In December, things went from bad to worse. After another expected rate hike on December 19, there was a golden opportunity for the Fed to say something — anything — to calm the markets. However, Powell did the opposite. What started as just a light breeze in early October had now turned into an F1 tornado in mid-December. And there was no indication that the winds would calm down. As the stock market trees bent sideways with December’s volatile winds, the Fed changed its tune. It began to realize that the treacherous winds were of its own creation. It also saw that the market was calling its bluff. Even though the Fed was talking tough, the fed funds futures market forecasted a higher probability of a 2019 rate cut than a rate increase. And this was something that the Fed could not ignore. Since the financial crisis, the Fed has maintained an illusion of control by emphasizing transparency. It can only be the master of the markets if the markets can be the master of the Fed. And so, if the market says: “Slow down on rate hikes,” the Fed must slow down on rate hikes. Uncertainty about the path of future rate increases is what led to the stock market’s recent turmoil. Yet, in the depths of this sell-off, the seeds were planted for the next rally. All that was needed was for the Fed to change its course. Powell will not make the mistake again of being too hawkish. He doesn’t want to be the Fed chairman who crashed the markets. Like all Fed chairmen, his tenure is temporary. And there are significant reasons to do whatever it takes to keep the market afloat. For this reason, the Fed has mirrored its hawkishness in December with dovishness in January. On Wednesday, the stock market rallied again as the Fed completely flipped the script from December. Powell hinted that the rate-hike cycle might be ending. He even went so far as to say the $4 trillion balance sheet would not be reduced further. Maybe that was the Fed’s intention all along. Perhaps the hawkish stance was only to create some wind to ensure the trees wouldn’t topple anytime soon.